Welcome to Clive Cussler’s latest tale, The Gangster. Co-written with Justin Scott, this book is an Isaac Bell adventure. Isaac Bell is a private detective working for the legendary Van Dorn Agency (like the Pinkerton’s of that era). The story starts with young Isaac and his friends joyriding in a steam locomotive. This is to suggest Mr. Bell’s daring-do and his mastery of the day’s technology. The adult Isaac Bell is a smooth but very tough character who is relentless in his pursuit of bad guys. In The Gangster, the bad guys are an organization called the Black Hand. They do typical gangster stuff, such as collecting protection money, but are escalating to dynamite as the tool of choice to persuade victims to capitulate. A group of victims has banded together to pay Van Dorn to run the Black Hander’s to ground. There is a lot of travel by rail since the technology of the day was the steel highway, and not the information highway. With Justin Scott, there are lots of steam engines, vintage automobiles, fledgling aircraft, and telegraphing. These are techno-thrillers, just not the technology you are used to. The Cussler/Justin Scott Van Dorn Agency adventures are action packed, fast paced and full of glorious exploits on the part of Mr. Bell. The Van Dorn motto is “We Never Give Up”, and they never do. 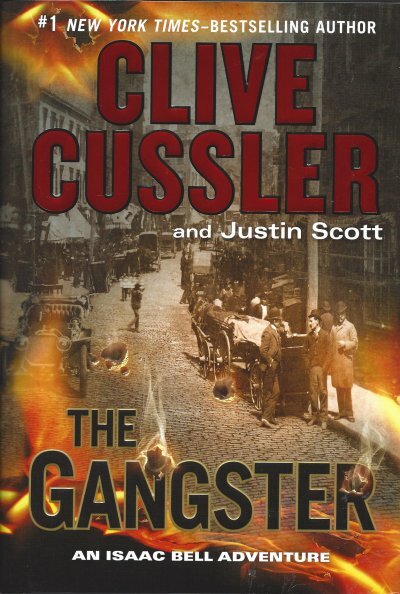 The Gangster is the ninth Isaac Bell adventure from Cussler/Justin Scott. I love Cussler’s stuff and have read it all.